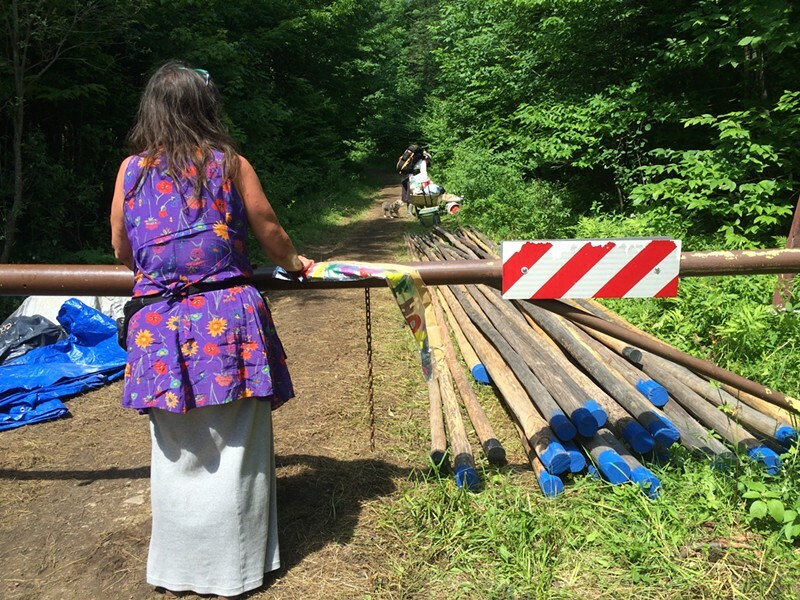 A woman who goes by “Feather” stands at the campsite entrance by poles that will be used to construct teepees. 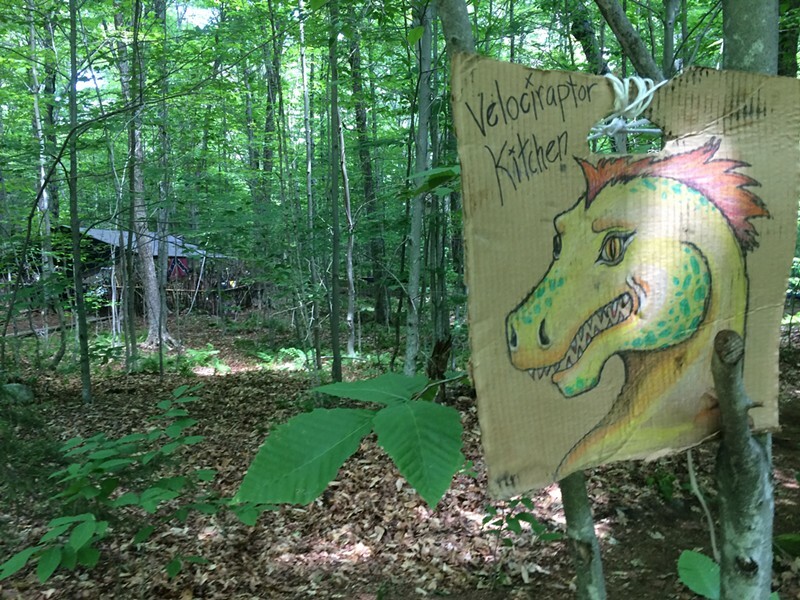 More than 700 people have gathered at Mount Tabor to prepare a campsite in the Green Mountain National Forest for a Rainbow Family of Living Light celebration that will culminate on July 4 with several thousand people massing. 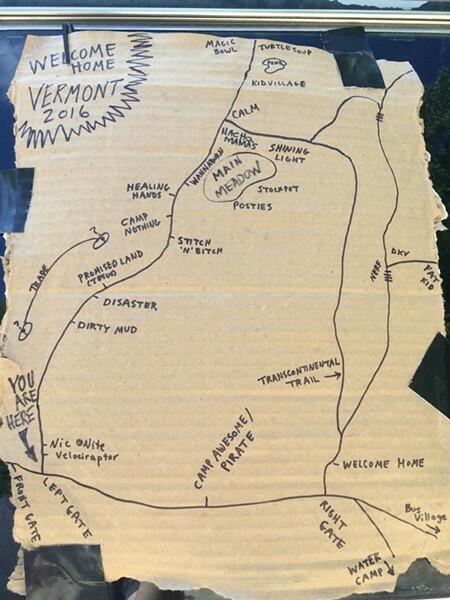 The vanguard of the group, which says it has no leadership and convenes annually to celebrate peace, nature and community, began arriving last week at a site northeast of Manchester Center. They are establishing a water supply, setting up kitchens and digging latrines. U.S. Forest Service officials expect as many as 10,000 more people to arrive in the coming weeks. The forest service stationed officers a few miles down the road from the campsite, and a Rutland County sheriff’s deputy idled Tuesday at the intersection of Route 7 and Brooklyn Road, eight miles below the gathering. While early arrivals have been able to park relatively close to the site, those who come next week will likely have to hike in from miles away. The forest service says that the gatherings, which have been held on federal land around the country, “can stress the services and resources of a small, rural community.” The nearby town of Mount Tabor has a population of just 250. The forest service, which is providing daily media updates, said Wednesday that authorities have issued 16 warning notices and eight violation notices for traffic or drug-related offenses. 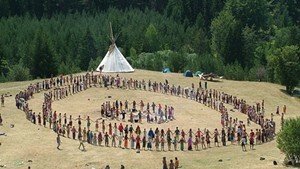 Forest service spokesman Ethan Ready said the Rainbow Family traditionally leaves behind several people after the main celebration to clean up the site. 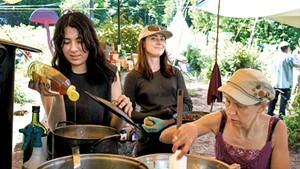 The site, a looping hiking trail atop Mount Tabor with a large meadow in the middle, includes several kitchen areas where food is prepared for a mass evening meal. Guests pitch their tents wherever they please. Teams on Tuesday were busy bringing in food and water, digging toilet trenches and even setting up pipes that will eventually carry water from nearby springs, a woman who goes by “Feather” explained. A first-time visitor was greeted warmly by almost everyone at the campsite.